This post complements the previous one published a few days ago and aims to give a summarized idea of what intermarket analysis is about, study developed by John Murphy in his two classic books 'Intermarket Technical Analysis: Trading Strategies for the Global Stock, Bond, Commodity and Currency Markets '(1991) and' Intermarket Analysis: Profiting from Global Market Relationships '(2004). Although they may seem out of date because it does not deal with recent events such as the crisis of 2007, its reading is indispensable for a trader because it gives us a global vision and a better outlook when explaining in very detail the relationship between the four markets (currency, commodities, bond, stocks) and how they influence one another. This will allow us to establish our portfolio, telling us the best place to start investing in instruments for the medium and long term. A basic idea of Murphy's book is to understand that the correlation between markets depends on the environment, which is stronger: inflationary (like the current one, with the general level of prices increasing), or deflationary (the opposite). Both extremes can be harmful to the economy: the first decreases the value of money over time, the other causes one to postpone his purchasing decisions ('I do not buy today, the next week will be cheaper'), situation which ends up increasing unemployment. The ideal is to maintain price stability, with a low and stable inflation, never close to zero, being the order of 2-3% the usual target. There are several but I only summarize the main ones. In an inflationary environment, stocks and bonds move in the same direction, or have a positive correlation. The useful fact here is that bonds usually change direction before stocks. Another key correlation is the inverse between the dollar and the commodities, being the best known and used by the traders the inverse gold-dollar relationship. Again, the useful fact for the trader here is that commodities usually change direction after stocks. As a complement, in inflation, a fall in i-rate drive up stocks (stimulate the economy, as in 2009-2016) and also bonds (lowers its yield, which is the inverse of the price). 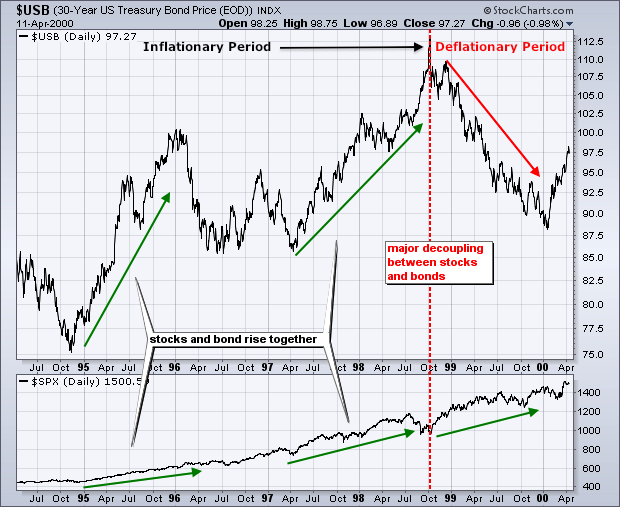 The intermarkets relationships during deflation are largely the same in inflation, except for one: stocks and bonds have a inverse correlation. In deflation, the fear of it moves the money from the stocks to the bonds, especially towards the safe Treasury Bonds that raise their price, lowering their yield. Observed that the relationship between stocks and bonds is here, inverse. What a central bank usually does as a solution is increase the i-rate to decrease the deflationary effect in the economy. the environment, inflationary and deflationary: gold and bonds, respectively. It is understandable that when an economy strengthens and inflation begins to rise, commodities begin to have more demand and raise their price. The main reason for the inverse relation between the dollar and the commodities is that this are quoted (exchanged) in dollars. When the price of the dollar falls, emerging markets importers will have more purchasing power and therefore, demand for these products will increase, which in turn will cause a rise in the prices of products. So, commodities have a positive relationship with stocks and i-rate, and inverse with bonds, both in inflationary or deflationary environment. 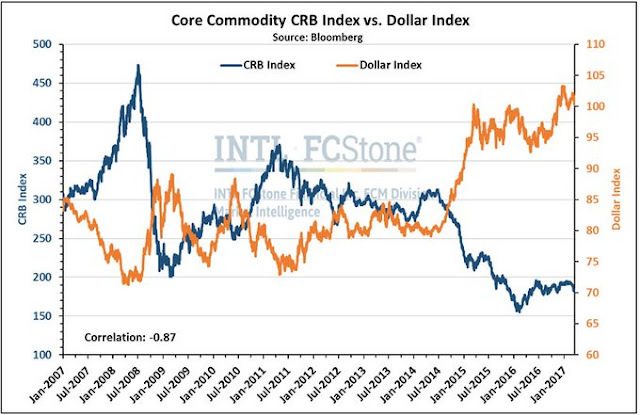 One of the best lessons of intermarket analysis: the inverse relationship between the dollar and commodities. This 2018, the crisis of emerging markets, very linked to commodities, is generating the strengthening of the dollar. Remember, a strong dollar will always be a problem for a commodity, given that these are always traded with that currency, while a weak dollar is usually a stimulus for exporters and therefore for commodities. Thus, in 2015, China devalued intentionally its currency (falling its exchange rate through a rise of the dollar/yuan pair) to lower its exports (and make imports more expensive) and therefore accelerate its growth to the annual target of 7%. Since 25 years China lives with a trade balance in surplus (exports> impots), with reserves and a fixed exchange rate. In the USA, in 2017 the dollar remained under great pressure, as it was expressed Trump's intention to keep it weak in the short term as a government strategy, to favor exports and weaken imports. Totally different this 2018 with the dollar strengthening towards the long term with the beginning of the Trade War and the tax reform, as was the initial express wish of Mnuchin. Definitely successful Trump's strategy with the dollar, complicating all its global peers and emerging markets.